Definition: Diclofenac (sold under a number of trade names) is a pain reliever in the drug class NSAID (non-steroidal anti-inflammatory drug). It is a similar medicine to ibuprofen or Motrin, though it’s not as common or available over-the-counter. It is supplied as or contained in medications under a variety of trade names. Its common brand names are Voltaren, Cataflam, and Zipsor. Diclofenac topical gel is available as the brand-name drugs Solaraze and Voltaren. It’s also available as a generic drug. Generic drugs usually cost less than brand-name versions. In some cases, they may not be available in every strength or form as a brand-name drug. The name “diclofenac” derives from its chemical name: 2-(2,6-dichloroaniline) phenylacetic acid. Diclofenac was first synthesized by Alfred Sallmann and Rudolf Pfister and introduced as Voltaren by Ciba-Geigy (now Novartis) in 1973, now by Glaxo SmithKline. In the United Kingdom, United States, India, and Brazil diclofenac may be supplied as either the sodium or potassium salt; in China, it is most often supplied as the sodium salt, while in some other countries it is only available as the potassium salt. It is available as a generic drug in a number of formulations, including diclofenac diethylamine, which is applied topically. Over-the-counter (OTC) use is approved in some countries for minor aches and pains and fever associated with common infections. Uses of Diclofenac: Diclofenac is used to treat pain, inflammatory disorders, and dysmenorrhea. 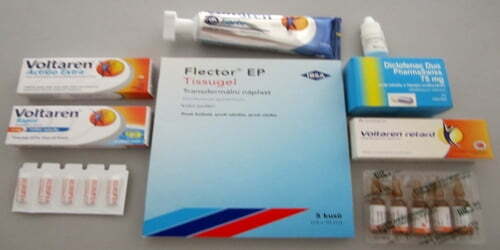 Different brands of diclofenac contain different amounts of this medicine and may have different uses. If people switch brands, their dose needs may change. Follow the doctor’s instructions about how much medicine to take. Do not take this medicine in larger amounts or for longer than recommended. Use the lowest dose that is effective in treating the patient’s condition. Inflammatory disorders may include musculoskeletal complaints, especially arthritis, rheumatoid arthritis, polymyositis, dermatomyositis, osteoarthritis, dental pain, temporomandibular joint (TMJ) pain, spondylarthritis, ankylosing spondylitis, gout attacks, and pain management in cases of kidney stones and gallstones. An additional indication is the treatment of acute migraines. Diclofenac is used commonly to treat mild to moderate postoperative or post-traumatic pain, in particular when inflammation is also present and is effective against menstrual pain and endometriosis. 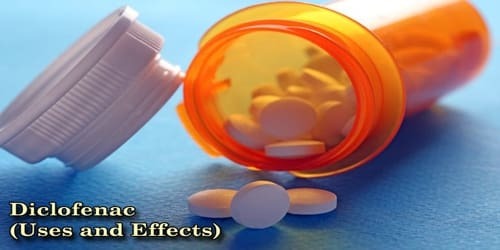 Diclofenac is often used to treat chronic pain associated with cancer, in particular, if inflammation is also present (Step I of the World Health Organization (WHO) scheme for the treatment of chronic pain). Diclofenac can be combined with opioids if needed such as a fixed combination of diclofenac and codeine. People should not use diclofenac if they have a history of allergic reaction to aspirin or NSAIDs (non-steroidal anti-inflammatory drugs). 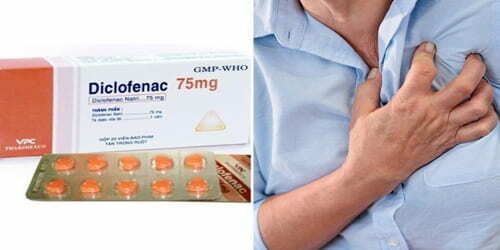 Health effects of Diclofenac: Diclofenac can increase people’s risk of fatal heart attack or stroke, especially if they use it long term or take high doses, or if they have heart disease. Even people without heart disease or risk factors could have a stroke or heart attack while taking this medicine. Mental health side effects have been reported. These symptoms are rare but exist in significant enough numbers to include as potential side effects. These include depression, anxiety, irritability, nightmares, and psychotic reactions. The NIH warns that patients who take diclofenac or other NSAIDs besides than aspirin may have an increased risk of heart attack, stroke, ulcers, bleeding, or holes in the stomach or intestine. It is important for patients to tell their doctors if there is a family history of heart disease, heart attack, or stroke. Patients should also inform their doctors if they smoke, have or have had high cholesterol, high blood pressure, or diabetes.